While all electic fans are not created equal, the installation and setup is generally very similar. First, check what has come with your fan. if you intend on "core" mounting your fan, you will need radiator zip ties, mounting feet and screws. Some fans will come with tabs for mounting and others may have the tabs already pre-attached to the unit. Attach the mounting tabs to the electric fan. Push on the speed nuts until snug. 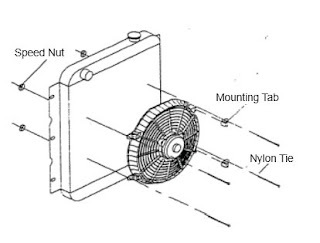 Attach the black fan motor wite to a ground, e.g. negative side of the battery, chassis etc. 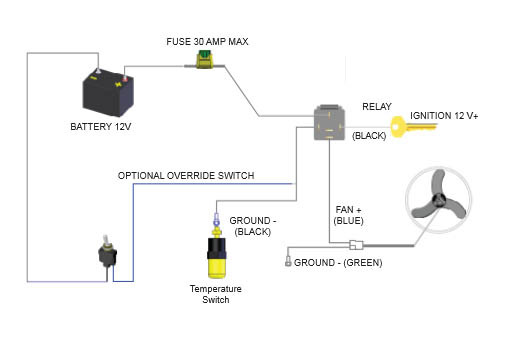 Note: Disconnect the battery prior to wiring any product! !